The National Disability Rights, Education, Activism, and Mentoring (DREAM) group through the website, Medium, is hosting a new online series to highlight the perspectives and experiences of disabled college students. Taubman College partners with the U-M Initiative on Disability Studies (UMInDS), the U-M Spectrum Center, and the U-M Women’s Studies department on a symposium that examines the impact of disability, gender-fluidity, and intersectionality on architecture and design. This symposium provides a critical platform to collect key thought leaders to expand the discourse on the myriad implications of this topic, and invites broad participation from the University of Michigan network of activists, facility personnel, students, academic staff, administrators, and faculty. 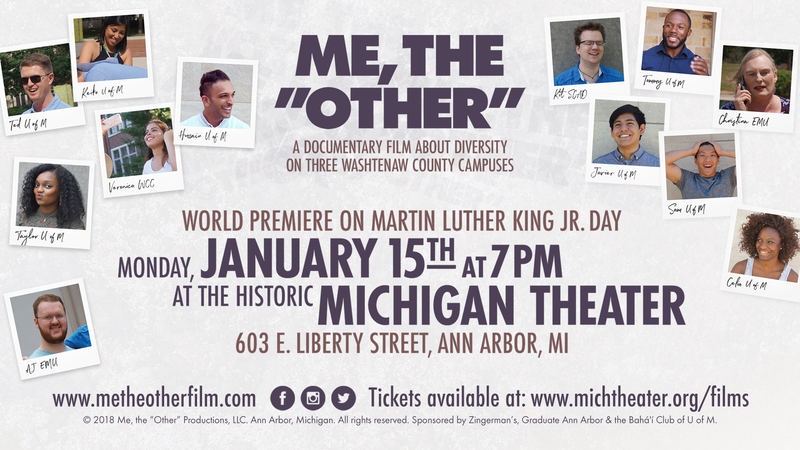 Me, The “Other” World Premiere on January 15th, 2018 at 7:00 PM at The Michigan Theater in downtown Ann Arbor, Michigan. Me, the “Other” is more than a film. It is the centerpiece of a platform for creating conversations about “otherness” and about what connects us and divides us through the documentary, as well as social media, the website, short films and conversations in local communities. We hope to see you there! 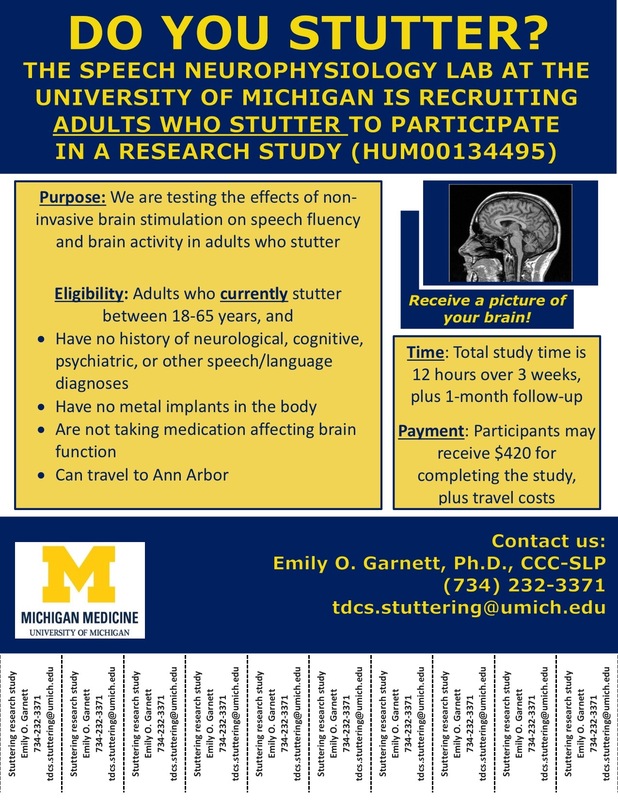 The Speech Neurophysiology lab conducts research on the neural bases of developmental stuttering, a neurodevelopmental disorder characterized by frequent occurrences of sound-syllable repetitions, prolongations, and blocks that interrupt the flow and rhythm of speech production. Stuttering affects approximately 1% of the population, and 5% of preschool age children. The cause of stuttering is unknown, although accumulating evidence points to a neurodevelopmental etiology. Treatment options for stuttering remain limited. Join LSA Student Government as we host the first annual Mental Health Week here on campus! 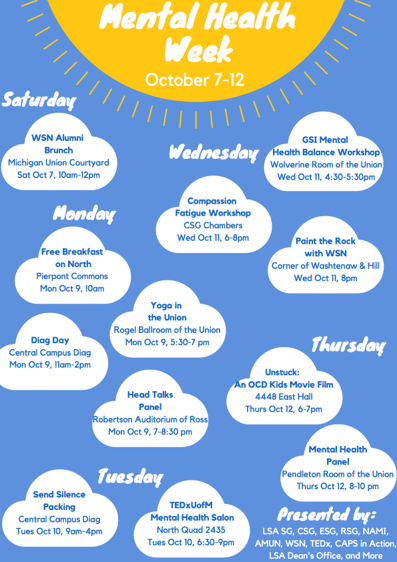 We've partnered with over a dozen mental health groups on campus to plan an event-filled week centered around student mental health. There's something for everyone! Check out the schedule to see the great events we have planned and reference the Facebook event here for details on times and locations for each event.